A.T tends to receive emails from Urbanspoon with the latest 50% discount offers for different restaurants. Basically, you get an email that tells you which restaurant is currently promoting, you book a table for that restaurant, eat there and receive the bill for half the original price. Very good deal if I do say so myself! This week, it was at Seamstress. The bill came out and it ended up being so cheap so we’ve decided on having what we call ‘Urbanspoon dinner dates’. Hopefully, there’ll be many more to come! 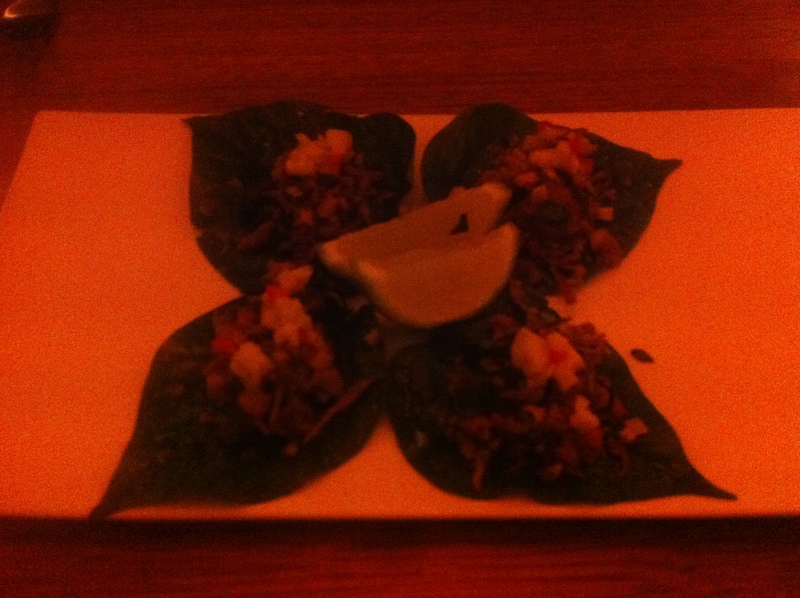 Betel leaf with confit duck leg & pickled mango Miangsom (small – $7.50) – for this, we wrapped the leaf into a ball with its contents inside and popped it into our mouths. Fun little entree, very crunchy however there weren’t a lot of flavours. I could only really taste the sourness, which was from the lemon. Still thought it was good because of its texture. Honey soy braised Wagyu shin, vanilla parsnip puree (small 180g – $9) – I thoroughly enjoyed this dish; the wagyu shin was braised nicely, very tender!! The honey soy glaze was sticky and sweet, and the puree was very smooth. Everything just went so well together. 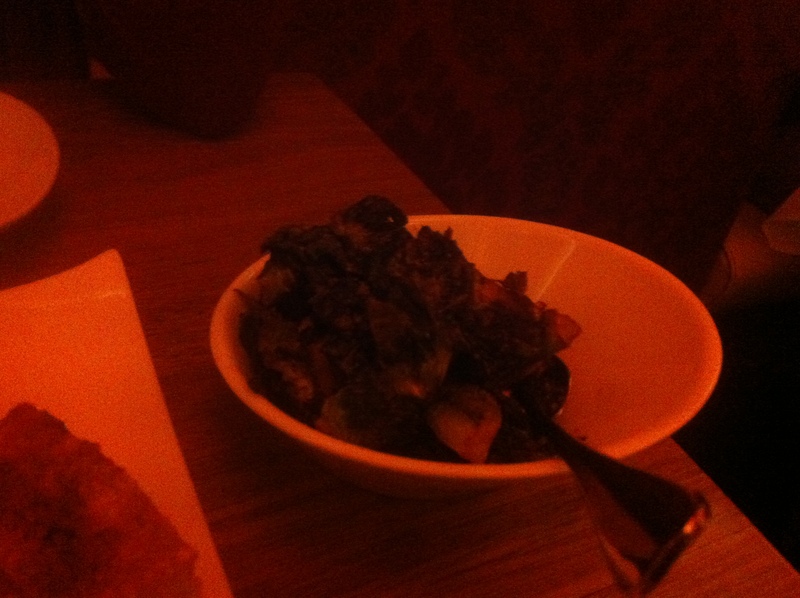 Crispy Brussels sprouts, lemon-miso & Turkish chili ($4) – my first taste of the brussels sprouts was awesome! Great crispy texture, really nice hit of spice and finishing with a roast aftertaste. Huge flavours leaving a big bang in your mouth. However, after eating more of it, I found it really salty. It would’ve been better eaten with rice, but A.T loved it and ate most of it. 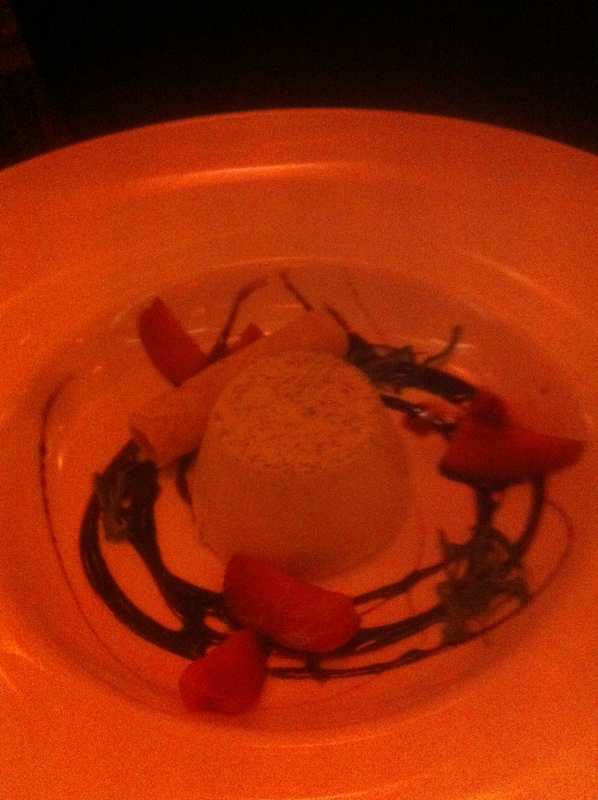 Palm sugar & vanilla bean panna cotta with strawberry & mint macerated in balsamic syrup ($8) – the texture and consistency of this panna cotta (especially in comparison to the one I ate at Desserts By Night) wow oh wow, incredible. It was smooth, silky and light, it just melted in my mouth and went down so well. The only shame was the balsamic syrup, which I thought was too bitter and didn’t harmonise with the rest of the plate. Elderflower and white chocolate pot de creme, coco nib tuile, honeycomb & coconut icecream ($8) – I’ve never tasted a pot de creme before, nor have I tried a coco nib tuile or knew what any of those words meant so I didn’t know what to expect. 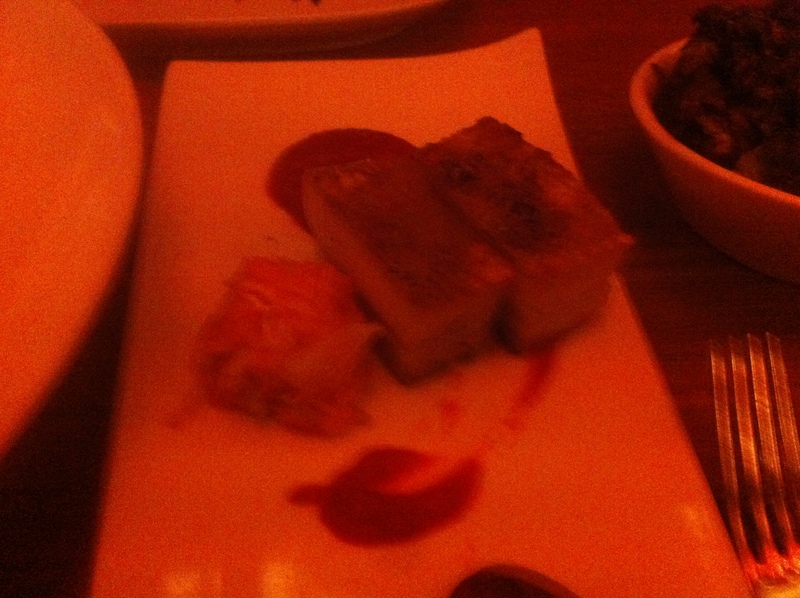 When my plate arrived I was awed by the presentation and couldn’t wait to dig in. 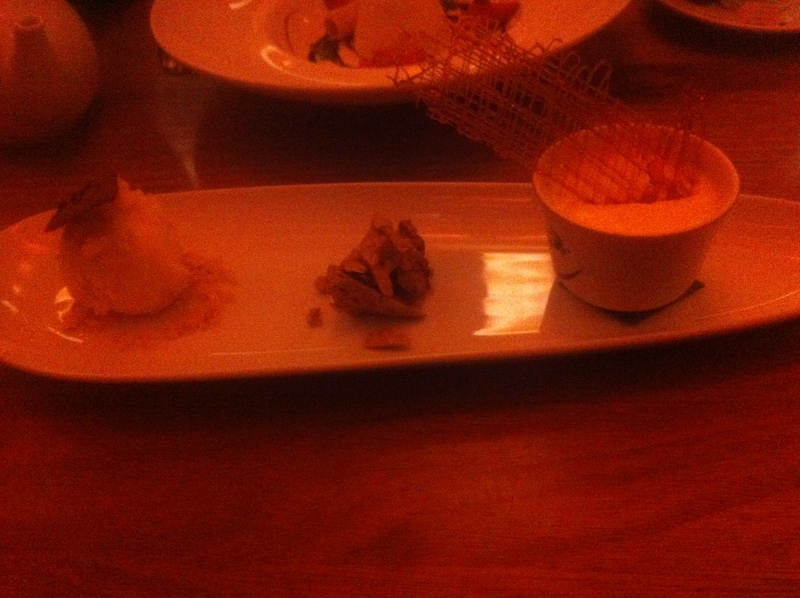 The pot de creme was quite sour so when eaten alone it kind of tasted like sour milk to me (but a nicer version…). However, the flavours were great when eaten with everything else. Both A.T and I agreed that the ice cream was amazing. It was more of a sweet creamy sorbet. The coco nib tuile tasted like caramel and had a texture similar to nougat, which really cut the creaminess of the ice-cream and pot de creme. All in all, I was very happy with my dessert. 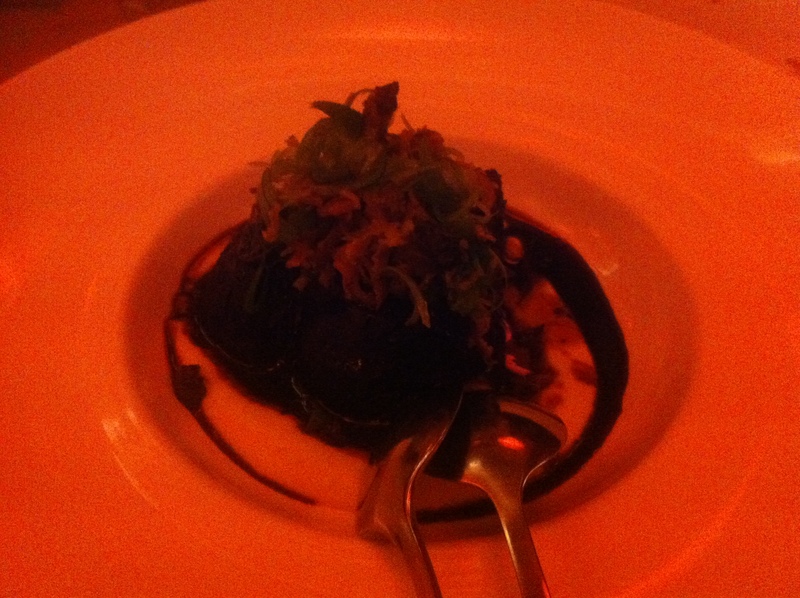 I was very satisfied with my Seamstress dining experience! 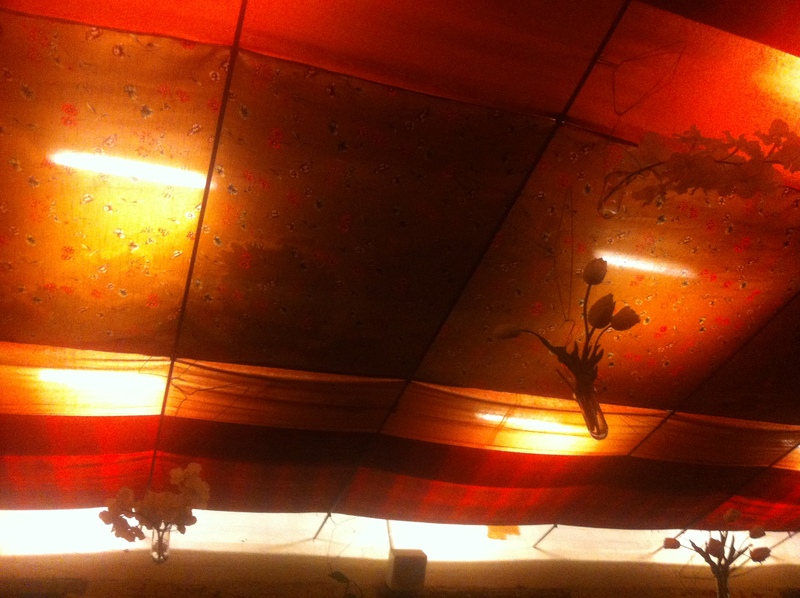 Great ambience, service and food at such a cheap and affordable price. Considering the amazing 50% discount we got, who wouldn’t be happy! Although I don’t think I would go again and pay full price, especially with the financial status that I’m in at the moment (aka peasant stats).